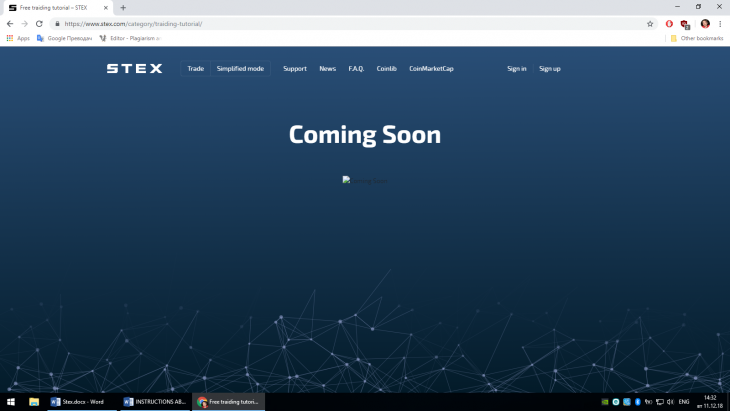 STEX.com Review 2019 – Scam or Not? STEX, an abbreviation for Smart Token Exchange, STEX is an innovative cryptocurrency trading platform with a focus on initial coin offerings and altcoins. STeX main goal is to solves liquidity issues using a wide array of unique high frequency trading algorithms that were initially designed for the traditional stock exchanges like the ones in New York City, Tokyo and London. Using these algorithms, STeX can complete high trade volumes in lightning speed. S TeX held an ICO in late 2017 so as to create a liquidity pool. 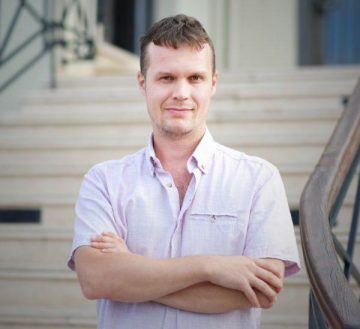 The man at the helm of STeX is Nicholas “Nick” Price (see picture below), a Russian businessman, who is more famous as CTO and founder of KeyCAPTCHA.com. In an interview for BTC.com Price said Stex.com is “the first exchange for grown-up people”. By this he means that this is a platform able to provide “a sufficient grade of service”. Other listed members of the team include Maxim Vladykin (CPO and Project Manager), Ivan Mityaev (CFO / Compliance and Legal Department), and Josh Clow (Marketing Officer). The process of verification of your STEX.com account is explained here. All user accounts on the platform are verified with Cryptonomica – a resource that verifies the identity of each and every user. After completing the verification with Cryptonomica, you can have you PGP key certified legally and it is valid for two years. Please note that the validity period of the key is set manually by the user. 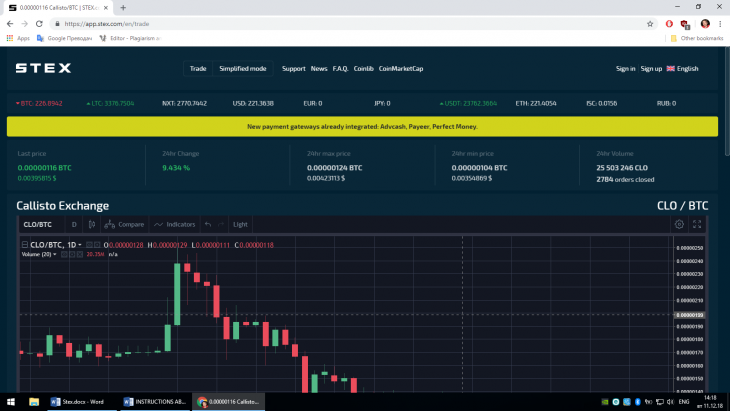 Prio r to opening an account on Stex.com, make sure you have a working Google account and a functioning electronic portfolio. As a first step, you should follow https://app.stex.com/en/profile/verification. Then, you need to link your Google account to your Stex.com account for verification purposes. To complete the verification process, you have to provide the info on a valid identity document such as your passport, identity card, or driving license. Apparently, account verification is mandatory only for depositing or withdrawing FIAT currencies. If you need to deposit or withdraw cryptocurrencies, you can skip this step. I was a bit surprised to find out that the account verification on Stex.com is actually paid. One user wondered why they should pay nearly EUR 96 to verify their account. On many other cryptocurrency trading platforms, it is actually free of charge. According to info in their FAQ section, STEX is a cryptocurrency only exchange. Deposits in fiat currencies such as US Dollars, Euro, and others are unacceptable. The support even warns that USDT (Tether) is a crypto asset and not the US Dollar and advises users not attempt to deposit USD to their USDT deposit address. This directly contradicts the Twitter post above, saying that account verification is necessary for the deposit or withdrawal of FIAT currencies. However, Cryptowisser also confirms that STEX.com does not accept any other deposit method than cryptocurrencies. 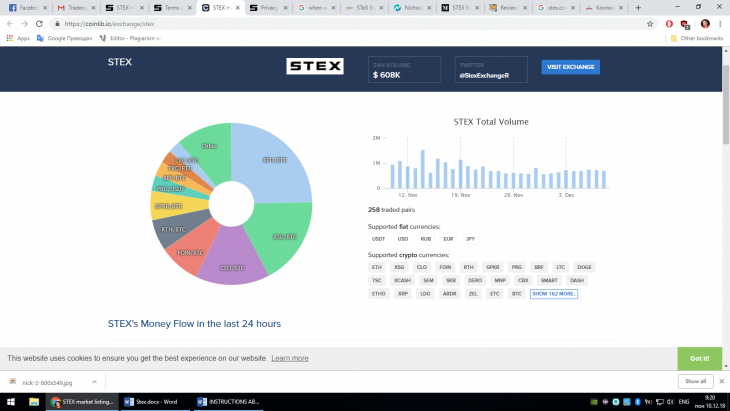 According to Coingecko, Stex.com supports as many as 514 different coins and they are all traded against the Bitcoin (BTC). As FIAT currencies are not accepted, there is no wire fee. Typically, when trading obscure cryptocurrencies, you need to trade into a more popular cryptocurrency – like BTC, ETH, or NEO – before trading it to another obscure cryptocurrency. You can’t trade directly between obscure cryptocurrencies. That’s a problem STeX seeks to solve. The trading process at Stex.com is explained in details here. As you can see in the picture below, the markets are divided into tabs located in the right corner of your screen. You can sort the currencies alphabetically or by quotation. Alternatively, you can use the “search” field to locate the cryptocurrency that you wish to trade. Once you choose an appropriate pair, you should navigate to to the page where you can buy or sell this cryptocurrency. To buy or sell the coins you have selected, you should specify their price and amount. You can set the price yourself, or choose a price from your “Trade History”. The actual price is to be found in the “Order” window. Similarly, you can set the amount you wish to trade manually, or click on the amount available on the wallet. To complete your trade request, you’ve got to click on “Buy” or “Sell”. Once you place an order, the system will search and find the party offering the same or lower price. If your price is lower than the price proposed by the other traders, your order with be transferred to the “Open Orders” list until any available order with the appropriate or lower price is created in the system. After that your order will be processed. According to Coingecko, Stex.com does not offer margin trading, neither could I find info if they offer any futures. This trading platform doesn’t charge different fees between takers and makers. Instead, they charge a flat fee in the amount of 0.20% of each trade. This fee level is slightly below the industry average of 0.25%. 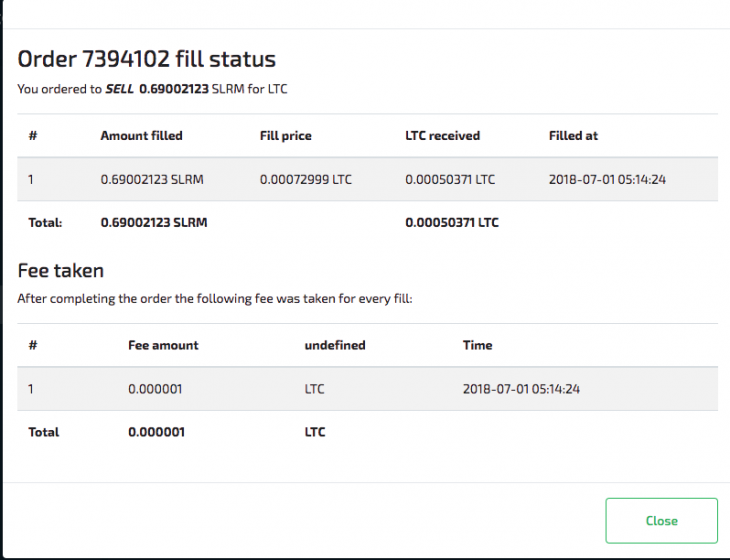 Stex.com is definitely not one of those exchanges that have competitive trading fees but then hit you on the way out with their withdrawal fees. They charge a withdrawal fee ranging between 0.001 and 0.002 BTC when you withdraw BTC. This is well within the industry average. Stex.com is organized very well. The content is neatly arranged into several sections and each of them is full of useful information. What first strikes the visitor is the straightforward move for transparency that the website designers have made. 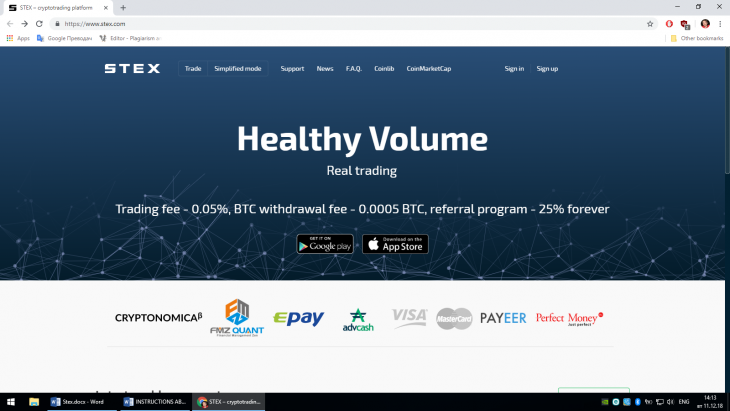 As you can see in the picture below, their trading and withdrawal fees are listed in large typeface right in the middle of their homepage, so that you can’t possibly miss this info. 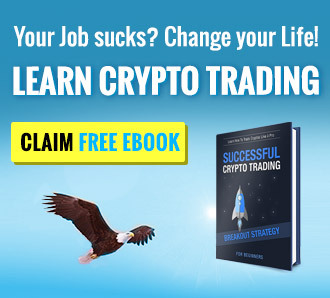 If this info is too much for you, or if you are not so experienced in cryptocurrency trading, you can always take advantage of the Simplified Mode that provides only the information that is essential for trading. 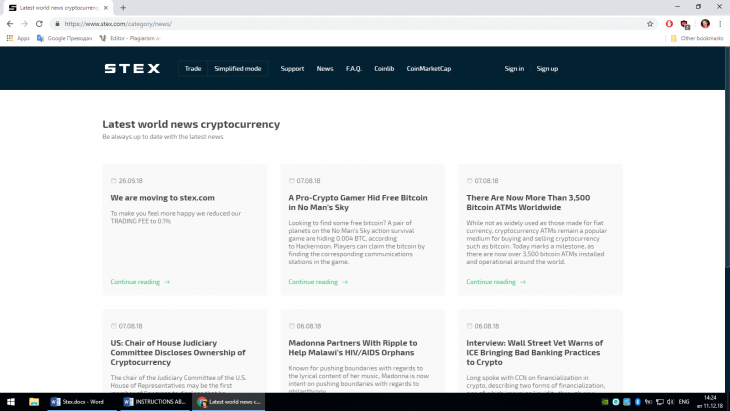 If you want to know what’s going on in the world of cryptocurrency trading, you can browse the News section of Stex.com and learn what’s making the headlines these days. We strongly recommend that you read thoroughly the info in the FAQ section of their website, as it provides valuable insights into some of the website’s most important functions and gives priceless knowledge of the trading process itself. All posts contain detailed explanations and pictures, so that you can rest assured that all of your concerns have been taken into account and properly addressed. Of all sections of Stex.com, it seems that “Trading Tutorial” is yet to be populated. When it becomes functional, we can only imagine how much easier the life of Stex.com’ users will become! 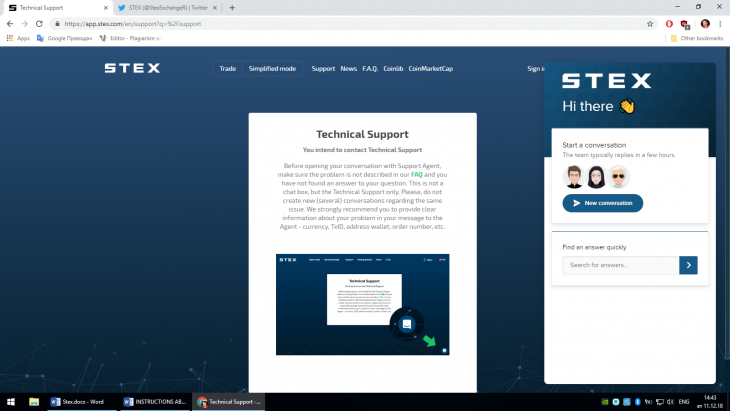 Stex.com advises that before starting a conversation with a Support Agent, users should make sure the problem is not described in their FAQ section, where the most typical user questions have been answered. The message box that you can see opened in the picture below is not a live chat box, meaning that you can expect a reply to your query after a few hours. Users are also advised to provide clear information about their problem when writing to a Support Agent, including currency, TxID, address wallet, order number, etc. 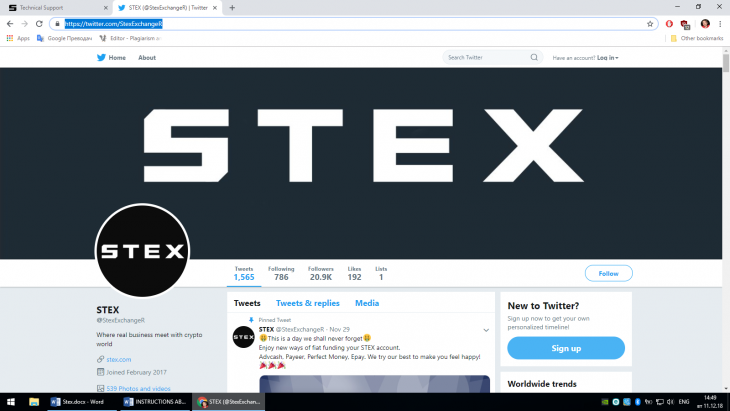 Stex.com also has a Twitter account, but it is mainly for updates about delisted coins, accepted payment methods, etc., and not for technical support. In any case, we do recommend following Stex.com on Twitter, if you wish to use their services. We could not find any info as to whether they provide customer support via phone or email. But since no such channels are listed on their website, we can confidently assume that they don’t, for the time being at least. There aren’t much user reviews regarding the customer support service of Stex.com. This is one of the few threads on the subject and the user’s issue appears to have been resolved successfully, albeit with a certain delay. This makes me think that the company’s customer support service is generally reliable and responsive. Sometimes the best advertisement is the lack of complaints! We did dig hard to find even the tiniest bit of complaint or a scam report against Stex.com, but our dedicated efforts were in vain. On the contrary, serious review providers like CryptoCro write: “I had no issues with STEX over the past two years,” adding “I am happy to recommend STEX, Happy trading! :D”. As I said above, the lack of negative feedback is the strongest proof of a trading platform’s safety and reliability. STEX.com takes ccount security very seriously, and customers have been asked to set up two-factor authentication (2FA) when they register an account. 2FA is an extra level of security that sends a special code to your mobile phone every time you want to log in, trade or withdraw funds. As per this Twitter post, however, 2FA has become optional since February 2018 (see the picture below). If you are still unsure if it’s completely safe to trade on Stex.com, we are happy to let you know that the website also uses the CryptoCurrency Security Standard (CCSS) to protect accounts, which is an industry standard for major exchanges. Yet, the security maniacs of Cryptowisser warn that the security score of this cryptocurrency exchange site is D-, when performing the test at Observatory by Mozilla (https://observatory.mozilla.org/). This is below the industry average when it comes to the top crypto exchanges. I just want to make it a point here that many other platforms like Terrexa and Tradeogre have been rated with an F by the same site. 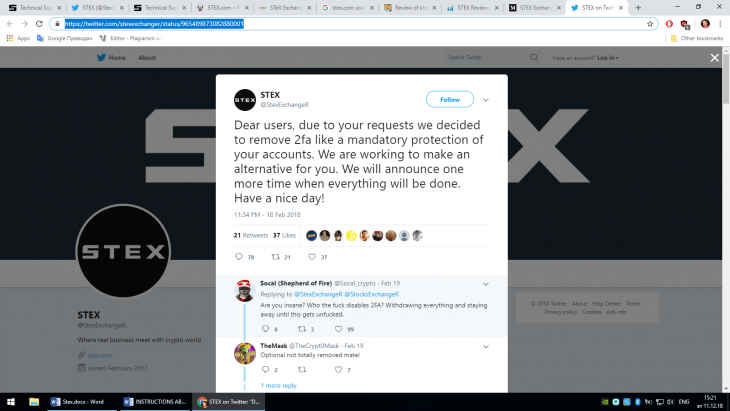 We could not find any info implying that Stex.com has ever been hacked. What makes the platform a particularly hard target for hackers is that their cloud cluster is physically hosted in many different countries. Thus, Stex.com reduces the possibility of getting shut down by any entity. In addition, all of their systems are encrypted and cannot be accessed without proper authorization from STeX’s personnel. Last but not least, the platform’s assets, including user funds, are stored in cold wallets and cannot be accessed from the internet. STeX aims to be the first cryptocurrency exchange with automated liquidity aggregation powered by “A2A” technology. 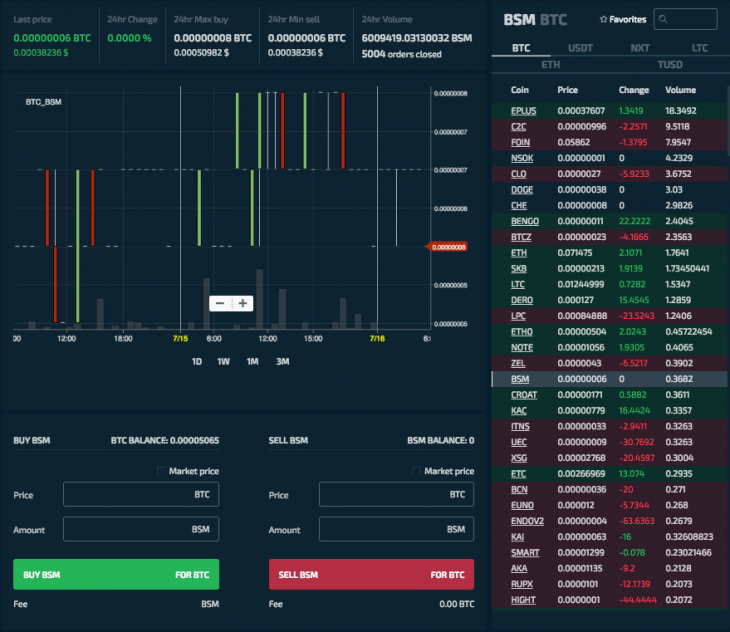 It allows investors to exchange “any” listed coin to “any” other listed coin in one trade directly.